Emmanuel Macron warned Theresa May that he was 'impatient' and that a long Brexit delay is not guaranteed as they arrived in Brussels for a crunch EU summit that could decide when the UK leaves. 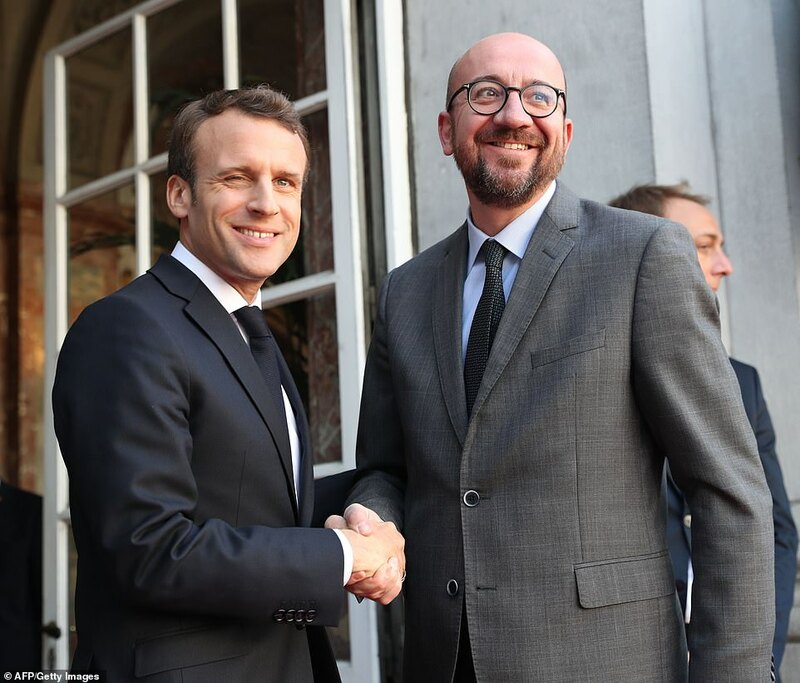 The French president appeared to wink today as he arrived in the Belgian capital after he had been urged not to 'humiliate' the Prime Minister. He is set to demand the UK is subjected to a number of punitive conditions with a Christmas deadline to finally quit the trade bloc, but also raised the spectre of a no-deal Brexit, possibly on Friday. Speaking to reporters at the start of the emergency meeting of national leaders he warned that 'nothing is settled', including a long delay, and he was 'impatient' to hear what Mrs May had to say. 'We must understand today why this request, what is the political project which justifies it and what are the clear proposals?' he said. 'It is 34 months since the British referendum, and the key for us is that we are able to pursue the European project in a coherent way. Mrs May had used her arrival in Brussels today where she will beg for a short extension to Article 50 to lash MPs for refusing to pass the Brexit deal, complaining 'we should have left by now'. The Prime Minister dodged questions about her own future as she prepared to beg EU leaders for terms on a new extension to the Article 50 negotiating period. Mrs May has landed in Brussels and said she wants an extension with a break clause so Britain can quit as soon as a deal gets through Parliament. She will say the delay should end on June 30. This evening she will give a 90-minute pitch on her plans - before dining alone while the 27 other leaders discuss her request, They are almost certain to reject it and force a delay lasting between December 31 this year and March 31, 2020. German Chancellor Angela Merkel wants a gentler, but longer extension, into 2020 - reflecting splits among the EU27 that are set to delay a ruling long into tonight. 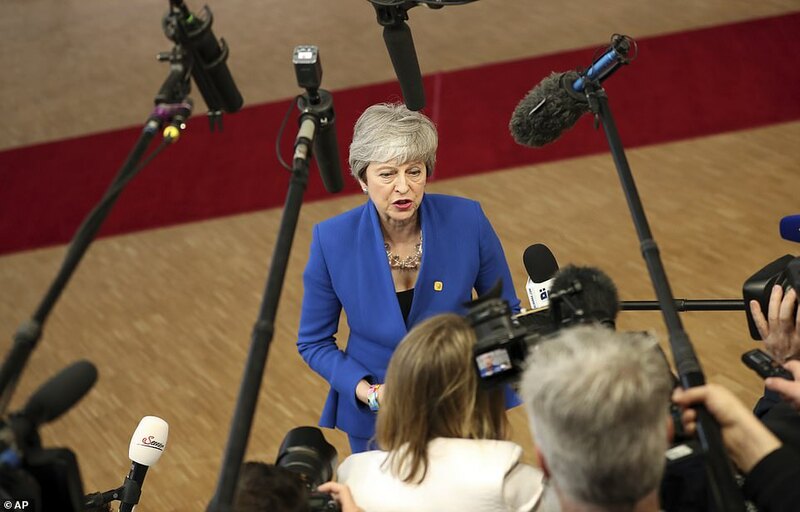 Arriving at the EU's headquarters the PM refused to say if she would quit if Britain is forced to swallow a longer delay - but insisted her aim is still to leave the EU on May 22 if she can win over Jeremy Corbyn. She said: 'What is important is that any extension enables us to leave at the point at which we ratify our Withdrawal Agreement. I know many people will be frustrated that the summit is taking place at all. The UK should have left by now'. President Macron is also calling for regular 'behaviour reviews' of the UK, a bonfire of its EU powers and posts and a 'Boris-proof' lock preventing a new Tory leader causing havoc within the EU if she stands down, despite warnings from Donald Tusk and Angela Merkel not to poison relations with Britain. Before taking off for Belgium a frustrated Theresa May blasted MPs for not voting through her EU divorce deal after Tory Eurosceptic Henry Smith accusing her of throwing away £1billion-a-month in payment to Brussels if she accepts a longer Article 50 extension tonight. Mrs May hit back: 'We could have been outside the EU by now if we'd managed to get the deal through Parliament and I'm continuing to work to deliver Brexit'. But with talks with Labour set to start again tomorrow, Mrs May and Jeremy Corbyn dodged the subject completely during Prime Minister's Questions. Earlier EU leaders urged Emmanuel Macron not to 'humiliate' her at tonight's historic summit where they are expected to impose a lengthy delay on Britain leaving the bloc. German Chancellor Angela Merkel and European Council President Donald Tusk have urged the French President to show respect and restraint - but Brexiteers claim the UK is already a 'laughing stock'. Former Tory leader Iain Duncan Smith said today that Mrs May should not be allowed to 'drift on' if she accepts the EU's longer delay and must quit before she faces another confidence vote. He said: 'It's almost certain she would lose, it would be humiliating'. 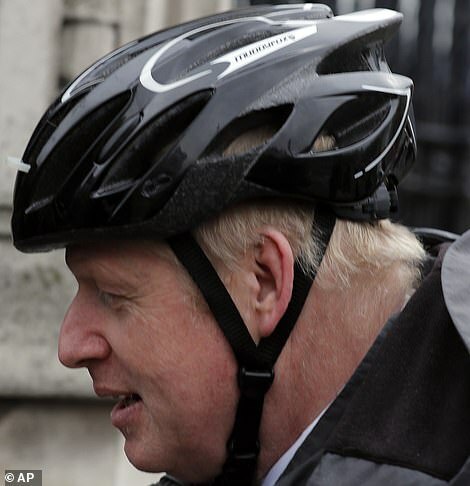 But Justice Secretary David Gauke suggested the PM could stay on for up to a year out of a sense of 'duty'. 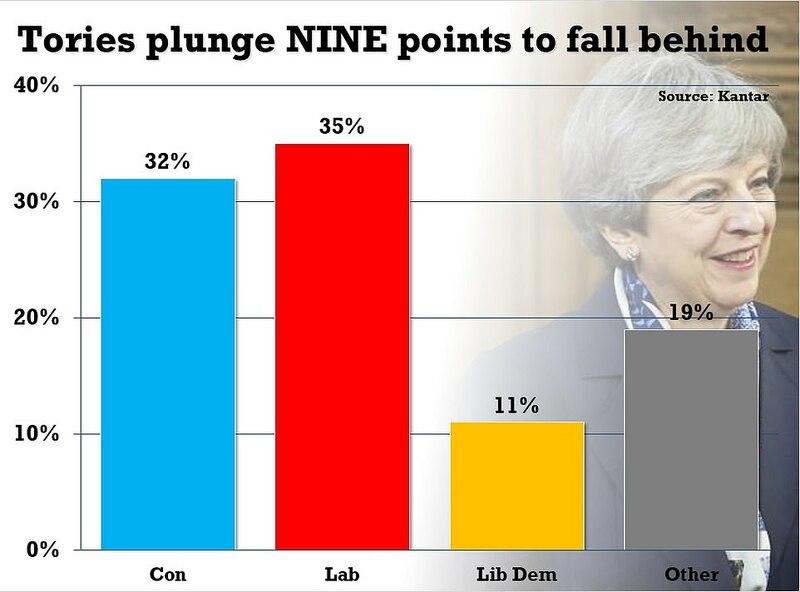 And in more bad news for the PM, a new Kantar opinion poll found the Tories have plunged nine points in a month, which would put Jeremy Corbyn in No 10 if there was a general election. 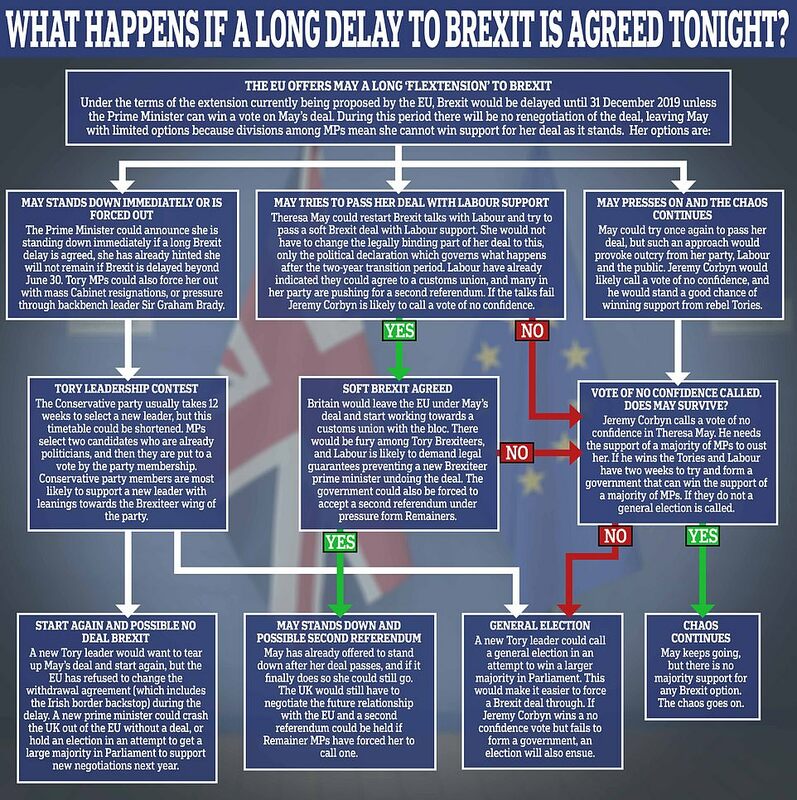 Tonight the EU is expected to demand a delay of between nine and 12 months to 'allow the UK to rethink its Brexit strategy' along with a 'Boris-proof' clause stopping a new Brexiteer Tory leader ripping up Mrs May's deal. Mrs Merkel told Germany's parliament today that EU leaders may well agree to a delay 'longer than the British prime minister (Theresa May) has requested'. She said she would meet French President Emmanuel Macron ahead of the summit with the aim of hashing out a common stance on the length of a further extension. It came as the Brexit Secretary Stephen Barclay admitted the EU is now in control but tried to shift the blame by saying: 'The Government has agreed a deal. Parliament is refusing to honour the result of the referendum'. Angela Merkel is believed to have 'taken on' Emmanuel Macron in several recent phone calls while last night Mr Tusk made a personal plea for him to drop his request for a 'good behaviour' review for Britain every three months. He said: 'Neither side should be allowed to feel humiliated. Whatever course of action is taken, it must not be influenced by negative emotions. We should treat the UK with the highest respect, as we want to remain friends and close partners, and as we will still need to agree on our future relations'. DUP Westminster leader Nigel Dodds branded the talks 'humiliating and embarrassing' for the UK, and claimed Britain was 'effectively holding out a begging bowl to European leaders'. Tory MP Anne Main has said the UK was becoming a 'laughing stock' and called it 'appalling that we may be seeking an extension with no real sense of purpose'. Brexit legislation could be brought back to the Commons in days if the Government can reach a deal with Labour, ministers said last night. Two Cabinet sources told the Mail discussions were under way about the possibility of asking MPs to vote this week on the Withdrawal Agreement Bill in the hope of still leaving the EU next month. 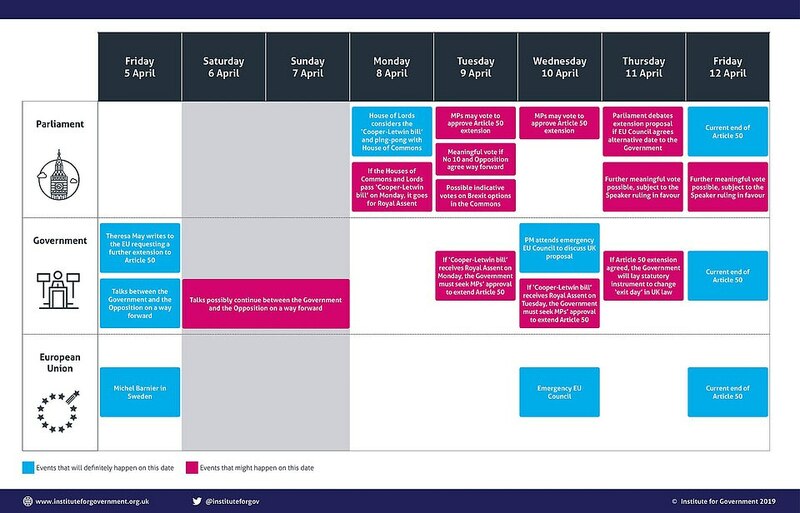 Ministers have also reserved the right to shorten the Easter break by asking MPs to sit on Monday and Tuesday next week if a deal looks close. Under one proposal, the Government would agree to allow free votes on key Labour demands, such as a customs union and a second referendum. If passed, these would then be incorporated into Theresa May's deal. But a Whitehall source last night said the 'high-risk' strategy would only be considered if ministers were certain that Labour were signed up to it. During Prime Minister's Questions today Labour leader Jeremy Corbyn said discussions are continuing in an attempt to find a compromise Brexit deal - but swiftly moved on. Mr Corbyn then claimed communities across the country have been 'abandoned' by the Government, adding: 'Official figures show that nine of the 10 most deprived council areas in this country have seen cuts almost three times the average of any other council. She also insisted leaving the EU in an 'orderly way' will be the best Brexit for the UK after being asked why she is not pursuing No Deal by one of her pwn MPs. Tory Craig Tracey urged the Prime Minister to consider leaving on Friday in order to respect their party's manifesto commitments to leave the customs union and single market. Mrs May replied: 'Can I agree with you that I believe a Conservative government will make a success of whatever the situation is in relation to Brexit. The SNP's Westminster leader Ian Blackford then asked if an second referendum has been offered to Labour to lure them into a cross-party Brexit deal - but Mrs May refused to say, adding her position 'hasn't changed'. The EU president Donald Tusk has warned tough conditions would be attached to any extended postponement. And he said the stalled withdrawal agreement would not be unpicked under any circumstances, including the election of a new Tory leader. The Prime Minister is asking for a short delay to try to get the agreement through Parliament, possibly in a compromise deal with Labour. But government sources said she was now resigned to a longer period if EU leaders demanded it. Austria's foreign minister said that she believed a Brexit extension for the UK would be agreed by the EU. Mrs May has insisted she could not countenance putting off Britain's departure beyond June 30 - but is now expected to accept it. Brexit Secretary Steve Barclay admitted today that the EU now in control - but blames MPs and said: 'It is Parliament that has forced this - not the Government'. He added: 'I don't want to see a delay for up to a year. But, the key with any delay is we are able to terminate it once we ratify in order that we can then get on and get a deal through Parliament, ratify that agreement and leave the EU. 'And I think that is what the EU leaders want, it is what the Prime Minister wants'. He also confirmed that if talks with Labour fail, the Government would have to turn 'indicative' votes into 'binding votes' on Brexit options to rush it through. But that would raise the risk of a customs union or a second referendum, which Mrs May previously said were her red lines. He said: 'The Prime Minister has said that we will come back to Parliament and look at how we then get clarity on a vote. 'One of the challenges there will be is how we have a stable majority to pass the legislation that would follow that vote. The Prime Minister faced a major Commons revolt last night, with 97 Tory MPs voting against any delay to the April 12 leaving date. Almost 80 more abstained, including a string of ministers. Labour backed the Brexit day delay, helping it pass by 420 votes to 110. But just 131 Tory MPs supported the PM's plan – 40 per cent of the parliamentary party. Cabinet ministers Andrea Leadsom and Liam Fox, who both abstained, both publicly questioned the PM's tactics. Mrs Leadsom urged her to ask German chancellor Angela Merkel to reopen the withdrawal agreement – despite the EU repeatedly ruling this out. Dr Fox hit out at suggestions Mrs May could agree to keep Britain in a customs union as part of a compromise with Labour. Solicitor general Robert Buckland told MPs the UK would be legally required to take part in European Parliament elections if it was a member state on May 23. But he suggested British MEPs might not have to take their seats if Westminster agreed an exit plan in the coming weeks. Downing Street indicated that Mrs Merkel had agreed to an extension of Article 50 in order to ensure 'Britain's orderly withdrawal'. 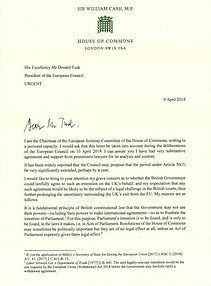 Eurosceptic Conservative MP Bill Cash tweeted a letter he had sent to European Council President Donald Tusk, claiming that 'any decision by the Prime Minister to accept a long extension to Article 50 is likely to be challenged in the UK courts'. In his letter, which he asked 'be taken into account' during today's EU Council talks, Mr Cash wrote: 'It is a fundamental principle of British constitutional law that the Government may not use their powers - including their powers to make international agreements - so as to frustrate the intention of Parliament. 'It is very important to note that Parliament's legal intention for the UK to leave the EU is not conditional upon a withdrawal agreement,' he added. Mr Cash continued: 'There is a clear legal route for the legislative will of Parliament to be delivered: the UK can exercise its legal entitlement to leave the EU on April 12 2019 in accordance with Article 50(3). 'A long extension, without any rationale for how it is needed in order to deliver the UK's exit from the EU, is simply not something to which the Prime Minister can lawfully agree. But there is the risk that French president Emmanuel Macron, who has questioned the point of further delay, could veto it or impose onerous conditions at a summit in Brussels tomorrow night. Mrs May can refuse the EU's offer of a long delay. But ministers fear MPs could vote to revoke Article 50 and cancel Brexit altogether unless a delay is agreed this evening. At a meeting of EU ministers in Luxembourg yesterday the bloc's chief negotiator, Michel Barnier, said a short extension was realistic because Mrs May had a plan to break the impasse. But according to two diplomatic notes seen by the Mail, there was a 'growing trend' and 'convergence of opinions' toward a date much later than June 30. Sources suggested that EU leaders are now set to extend Article 50 until at least the end of this year. 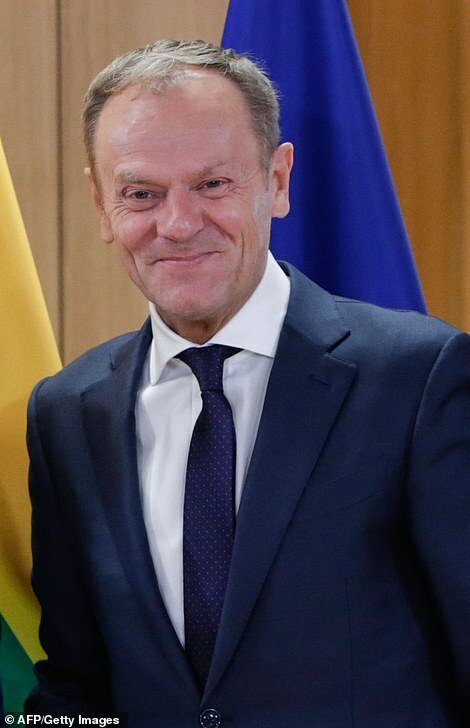 Mr Tusk last night told EU leaders there was little reason to believe that Mrs May would be able to get an agreement through Parliament by July. 'Granting such an extension would increase the risk of a rolling series of short extensions and emergency summits, creating new cliff-edge dates,' he said. EU leaders have been spooked by warnings from Brexit hardliners, including Jacob Rees-Mogg, that the UK could deploy wrecking tactics if it remained in the EU, such as voting down its budget. Mr Tusk said the UK would be expected to guarantee it would work in a spirit of 'sincere co-operation'. Tory Eurosceptic Anne-Marie Morris warned she could vote for Nigel Farage's new Brexit Party in the European Parliament elections in protest at the delay. 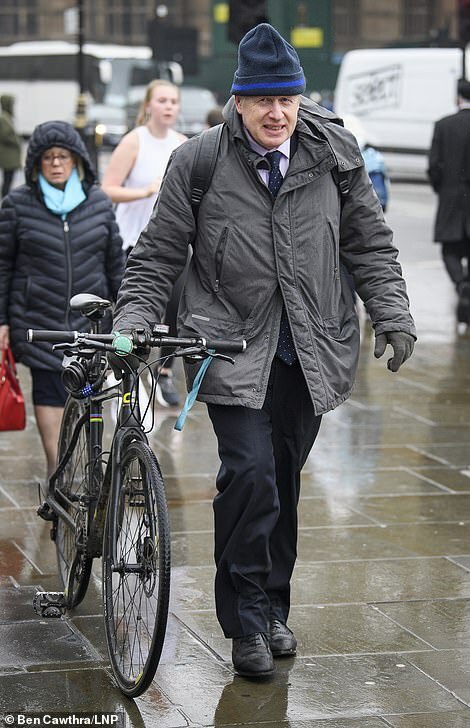 And Boris Johnson's father Stanley revealed he hopes to stand as a candidate on May 23, almost three years after Britain voted to leave. The Tory party has plunged nine points in the polls a new survey suggests today. 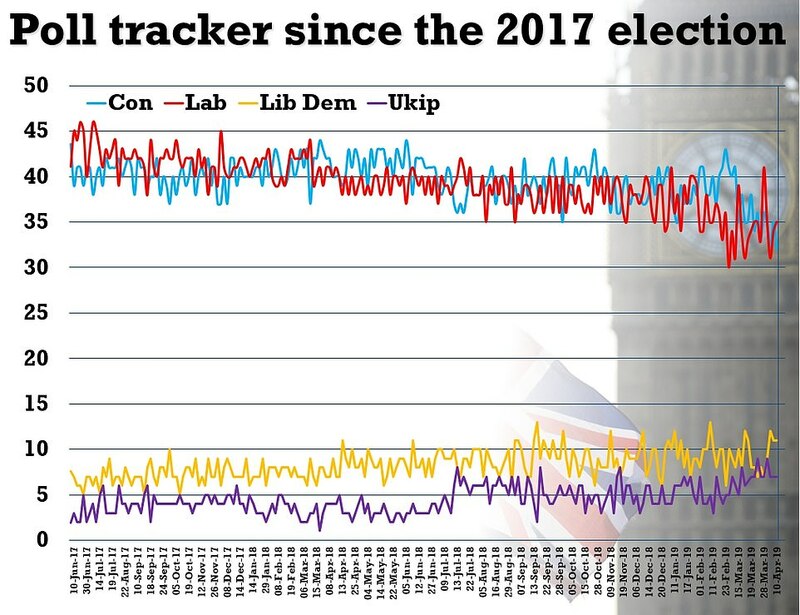 Kantar's latest research suggests the Brexit chaos is finally hitting support for Theresa May's party as the PM seeks a second delay to leaving the EU. The firm found the Conservatives are backed by 32 per cent, down from 41 per cent in the same survey in March. The dramatic poll means Labour takes the lead with Kantar after rising four points, from 31 per cent to 35 per cent. The Liberal Democrats have also gained group, surged three to 11 per cent support in the new survey. 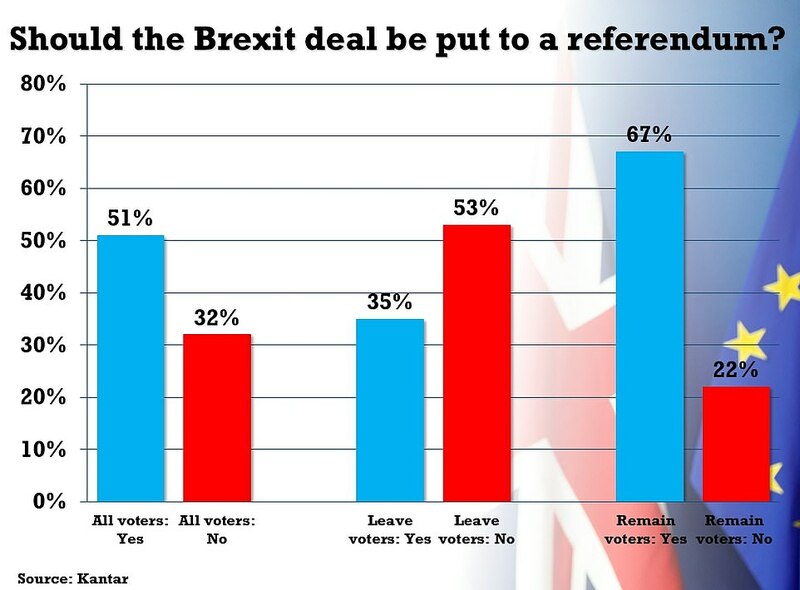 Kantar's new poll also finds more than half of people now support putting the Brexit deal to a referendum. The poll findings were published as EU leaders today urged Emmanuel Macron not to 'humiliate' Mrs May at tonight's historic summit where they are expected to impose a lengthy delay to Brexit on the UK. Britain is set to be pushed into a year-long delay to Brexit tonight after Theresa May effectively axed the prospect of No Deal on Friday. The Prime Minister's hopes of a short extension that expires in June appear to be doomed as she prepares to fly to Brussels following PMQs today. Views among EU leaders vary - but the expiry of Article 50 looks likely to be shifted to at least the end of this year. Mrs May could get the option to break the extension early if her deal finally passes Parliament - but EU Council President Donald Tusk has gone public with warnings there is 'little reason' to believe it will ever happen. French President Emmanuel Macron has taken the most hardline stance, insisting Britain must be tied into strict rules to stop it misbehaving during any new delay. He is highly unlikely to actually veto the delay, however. When the summit starts at around 5pm this evening, Mrs May will first answer questions from EU leaders - building on a diplomatic blitz that included trips to Paris and Berlin yesterday. She will then be kicked out of the summit so the other 27 EU leaders can decide what to do over dinner. Only once they have a unanimous agreement on delay will Mrs May be asked to say Yes or No. At the last summit three weeks ago the EU leaders debated in private for almost six hours. A similar row this time would mean Britain's fate being decided at around midnight tonight. Whatever happens, the PM must return to the Commons tomorrow to explain to MPs when and if Brexit will ever happen. What has Mrs May asked for? In a letter to Donald Tusk she formally requested an extension to Article 50 that will delay the UK's departure beyond April 12 to June 30 - but she also wants a 'termination clause'. This would allow the UK to leave on May 22 - the day before European elections - if a deal can be pushed through the UK Parliament. However, this delay is a carbon copy of that sought by Mrs May before the last emergency summit in March - which was rejected. Mr Tusk said that a 12-month 'flextension' to March 29 2020 is 'the only reasonable way out' of the crisis and has urged leaders of the EU's 27 member states to back him at Wednesday's summit. Ahead of the summit today, Mr Tusk urged the 27 leaders to consider a long delay because there was 'little reason' to believe the deal would be passed by MPs before the end of June. He said Brexit should be put off by 'no longer than one year' with Britain allowed to leave if and when the deal does somehow get through Parliament. If confirmed tonight such an extension is likely to spark fury among Tory Brexiteer MPs, with Jacob Rees-Mogg suggesting if we were kept in we should be troublesome to the rest of the EU, politically. And Mrs May has previously said she would not be able to accept such a delay - suggesting it could prompt her to resign. This could lead to a summer leadership battle in Tory ranks before a new, most likely Brexiteer leader, takes over. How does the EU make its decision? It is hard to say - but it is highly unlikely to be on Friday as the law currently says. The PM clearly still wants to get out of the EU before European Parliament elections have to be held on May 22 but this is ultimately up to Brussels. Were she to pass the deal in the next couple of weeks, it is probably possible to conclude exit by around late May. If she fails again however, exit day will likely be pushed back by at least nine to 12 months - setting the stage for a change of PM in Downing Street and possibly either an election or a referendum, or even both. What is happening in the cross party talks? The Prime Minister has said the divorce deal could not be changed but announced last week she would seek a new consensus with Jeremy Corbyn on the political declaration about the final UK-EU agreement. It is her final roll of the dice to save the deal. Talks broke down on Friday between ministers and officials from both parties, despite previous efforts being hailed as 'constructive'. After technical discussions on Monday, they finally resumed yesterday - but have now been adjourned again until tomorrow. If the talks fail, Mrs May has promised to put options to Parliament and agreed to be bound by the result. Time is short to actually call this vote. In a second round of indicative votes last week a customs union, Norway-style soft Brexit and second referendum were the leading options - but none got a majority of MPs. What does Mrs May's shift mean? Mrs May has abandoned all hope of winning over remaining Tory Brexiteers and the DUP on the terms of her current deal. Striking a cross-party deal with Labour on the future relationship will require Mrs May to abandon many of her red lines - including potentially on free movement and striking trade deals. To get an agreement with Labour, Mrs May will need to agree the political declaration should spell out a much softer Brexit than her current plans do. This might mean a permanent UK-EU customs union or even staying in the EU Single Market. What if Mr Corbyn says No? Mrs May said if she cannot cut a deal with Corbyn, she would ask Parliament to come up with options - and promised to follow orders from MPs. They would probably pass if the Tories whipped for them - but it would almost certainly mean ministers quitting the Government. Nodbody knows for sure. Mrs May has announced she would go if and when her divorce deal passed so a new Tory leader could take charge of the trade talks phase. In practice, it drained Mrs May of all remaining political capital. Most in Westminster think her Premiership is over within weeks at the latest. As her deal folded for a third time a fortnight ago, she faced immediate calls from Labour leader Jeremy Corbyn so stand down with instant effect. What is clear is there is already a fight underway for the Tory leadership. Does is all mean there will be an election? Probably, at some point though the immediate chances have fallen because of the latest events. The Commons is deadlocked and the Government has no functional majority. While the Fixed Term Parliaments Act means the Government can stumble on, it will become increasingly powerless. Mrs May could try to call one herself or, assuming she stands down, her successor could do so. Would May lead the Tories into an early election? Unlikely. Having admitted to her party she would go if the deal passes, Mrs May's political career is doomed. While there is no procedural way to remove her, a withdrawal of political support from the Cabinet or Tory HQ would probably finish her even if she wanted to stay. The question of whether to call an election finally reached the Cabinet last week. MPs voting to seize control of Brexit from ministers has only fuelled the demands. Or an election campaign that takes months, costs millions of pounds could still end up in a hung Parliament and continued stalemate. This is the current forecast by polling expert Sir John Curtice. 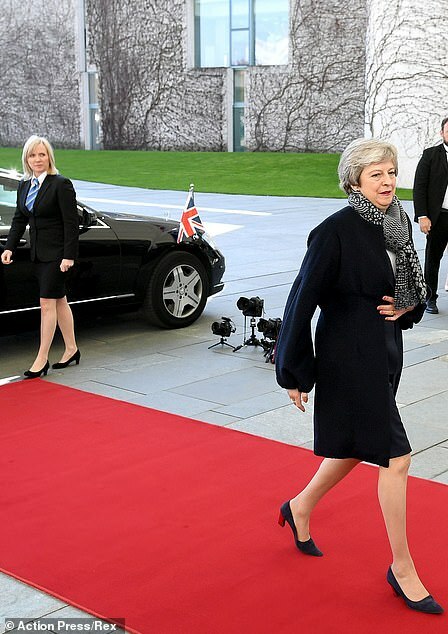 There was an awkward moment for Theresa May as she arrived at the German Chancellery for talks with Angela Merkel – who failed to greet her. 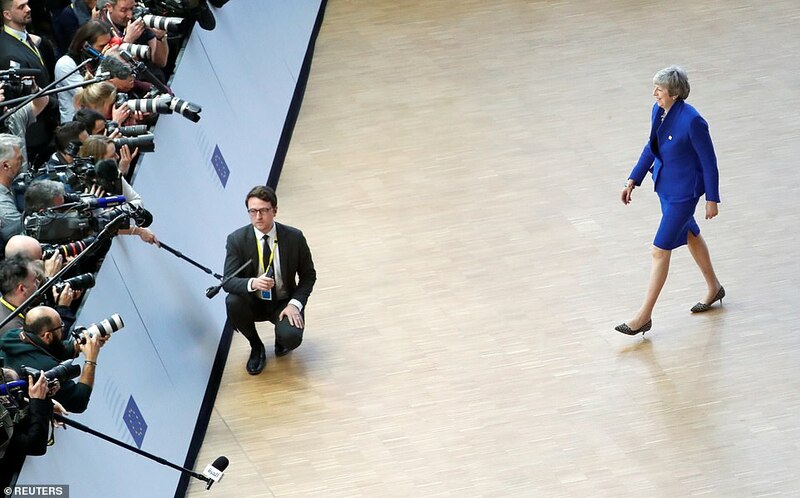 Mrs Merkel traditionally meets important guests on the red carpet, but the Prime Minister was forced to walk down alone before entering the building. The two leaders then re-emerged to shake hands for the cameras before disappearing again inside. A body language expert yesterday suggested that the two leaders were at odds over a Brexit extension. Mrs May's hand clasp resembled a 'begging gesture' while both women cut 'grim' expressions. Judi James said: 'It's the huge spatial gap between these two women that gives the suggestion of further separation rather than unity. It was a different scene when Mrs May later headed to Paris to meet French President Emmanuel Macron, who greeted her with a hug and kisses on both cheeks. Theresa May faced a mass rebellion by Tory MPs last night on a motion to delay Brexit to June 30 amid claims the UK was being turned into a 'laughing stock'. Ninety-seven backbench Tories voted against the motion, including former Brexit secretary Dominic Raab and former foreign secretary Boris Johnson. And it came as the Prime Minister also faced open revolt in the Cabinet with ministers Andrea Leadsom and Liam Fox publicly challenging her Brexit strategy. In the Commons, and despite a three-line whip, almost 80 Tories were absent including several ministers, leaving just 131 to vote in favour of the motion. No10 said there would be no disciplining of MPs who did not follow the party line. The Commons approved the motion on the extension request by 420 votes to 110, a majority of 310. Former education minister Tim Loughton attacked 'saboteurs' on both sides for trying to 'hamstring' the Prime Minister. He urged French president Emmanuel Macron and German Chancellor Angela Merkel to veto an extension and 'put us out of our misery now'. Shadow chancellor John McDonnell yesterday joined talks between the two parties in Whitehall, which also included Chancellor Philip Hammond and Environment Secretary Michael Gove. Mr McDonnell said Labour was seeking assurances that any agreement could not be overturned by a future Tory prime minister. His comments reflect concern in Labour ranks that a Brexiteer such as Boris Johnson could simply tear up any agreement if they became PM after Mrs May steps down. Mr McDonnell said: 'Some of the discussion that will take place will be about how any deal is secure for the long term and how best to secure that either through domestic legislation or treaty.' He expected the discussions would also cover alignment with the single market and environmental, consumer and workers' rights. Asked whether the Government was indicating it would back a customs union, Mr McDonnell said: 'Not yet – not even changes in language that I detect.' Further talks are due to take place tomorrow. 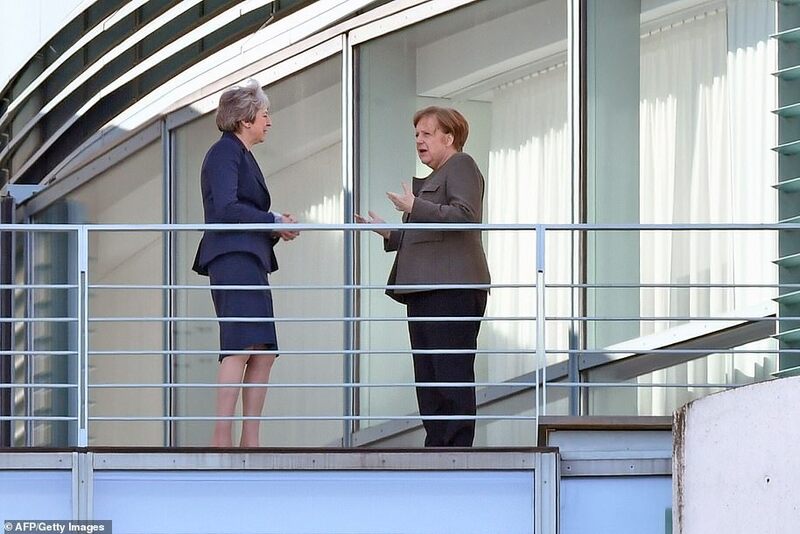 As Mrs May flew to Berlin for talks yesterday, Commons Leader Mrs Leadsom urged her to ask Mrs Merkel to reopen the Withdrawal Agreement forged last November. Even though the Prime Minister has long given up attempts at changes as the EU has repeatedly ruled them out, Mrs Leadsom raised the prospect she should still be pushing for them. Speaking outside her London home, she told ITV News: 'The Prime Minister is off to see Angela Merkel today and it would be fantastic if Angela Merkel will try to support a proper UK Brexit by agreeing to reopen the Withdrawal Agreement. 'There have been rumours over the weekend some senior members of the German government would be willing to do that in order to get Theresa May's deal over the line. There were also signs of resistance in the Cabinet to compromise with Labour, with International Trade Secretary Mr Fox warning that a customs union would leave the UK 'stuck in the worst of both worlds'. DUP party leader Arlene Foster and Westminster leader Nigel Dodds both accused Mrs May of 'begging' European leaders for help to break the impasse. 'The talks between the Prime Minister and the leaders of France and Germany is humiliating and embarrassing for the UK,' Mr Dodds said last night. Earlier, Mrs Foster questioned Mrs May's leadership qualities. 'She needed to be strong, she needed to show leadership, and I'm sorry to say that hasn't been evident in these past couple of months,' she told the BBC. Three senior Tories in their 40s brandished their youth appeal yesterday as they pitched to be the 'next generation' leader to succeed Theresa May. Health Secretary Matt Hancock, 40, International Development Secretary Penny Mordaunt, 46, and Foreign Affairs committee chairman Tom Tugendhat, 45, are all expected to run for PM when Theresa May steps down. All three have endorsed a report which warned the Conservative Party faces an 'existential' crisis unless it appeals to the young. Sun 29° Aries 01' 56"
Moon 27° Libra 52' 26"
Mercury 02° Aries 40' 28"
Venus 28° Pisces 26' 05"
Mars 12° Gemini 35' 46"